Secluded behind high hedges, hidden pathways and romantic gardens, lies the Secret Garden Inn and Cottages. 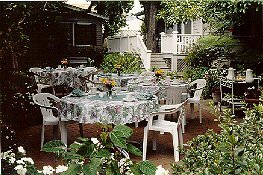 The main house is an original California Craftsman, built in 1908, was opened as a Bed & Breakfast in 1980 and is now owned and hosted by Jack Greenwald and Christine Dunstan. The quiet and relaxed atmosphere is perfect for a romantic getaway. You can stay in one of the Main House guest rooms or in a Cottage guest room or suite. Many of the rooms have their own secluded outdoor HotTubs. 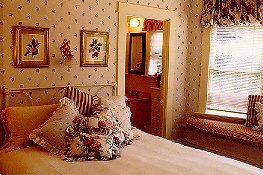 Each room or suite is lovingly furnished with Early American antiques and wicker appointments, chintz quilts and cushions. All the rooms have private bathrooms and many have Clawfoot antique bath tubs. Indulge in a leisurely breakfast in bed in the privacy of your own patio or with the other guests beneath the lacy entwined branches of the Persimmon and Avocado trees. Wine and cheese is served daily in the afternoon. Rates are from $121-$231 per night and include a full breakfast.